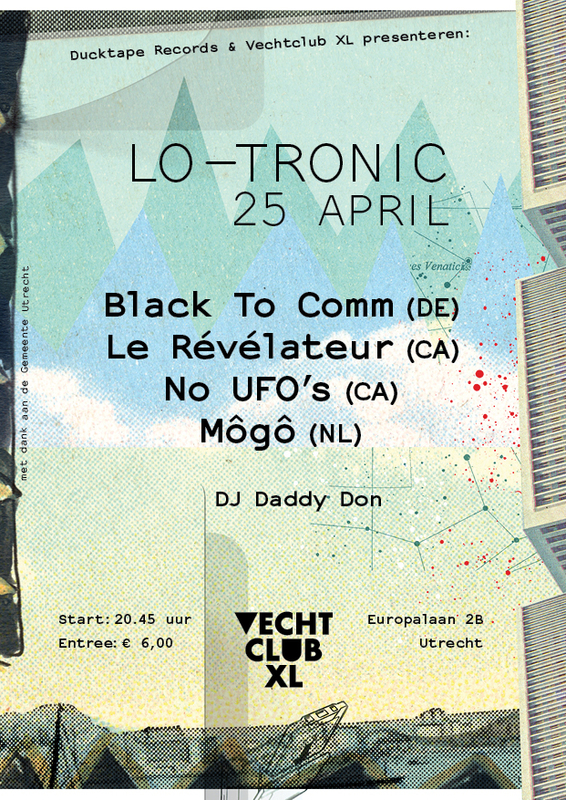 In samenwerking met het label Ducktape Records (Utrecht) organiseert Vechtclub XL de elektronische muziekavond Lo-Tronic. Zie voor meer informatie het Facebook-evenement. Black To Comm is the alias of Hamburg, Germany’s Marc Richter.Since 2003 Richter has released 8 full-length albums. Richter utilizes vinyl loops, antique electronic & pump organs, YouTube samples, processed voice and field recordings and various small acoustic and electronic instruments and effect devices to create intricate multi-layered collage based works. He also runs the Dekorder label since 2003 releasing music by Felix Kubin, The Hafler Trio, Kemialliset Ystävät, Stephan Mathieu, Richard Youngs, Excepter and many others. Le Révélateur started in 2008 as a solo venture of Montreal based electronic musician Roger Tellier-Craig (a member of Godspeed You! Black Emperor for five years, Tellier-Craig left the mythical outfit to work on other projects). It has since expanded into an audiovisual duo with the inclusion of video artist Sabrina Ratté in 2010. They explore their fascination with combinations of electronic image and sound, using a broad array of digital and analogue technologies. Le Révélateur has released recordings on Gneiss Things and NNA Tapes. No UFO’s has a clear debt to 1970s German electronic music, but Konrad Jandav pulls on various other influences as well: minimal synth, ambient, Detroit techno. Since self-releasing his debut in 2010 (later reissued by Spectrum Spools), No UFO’s has produced a series of acclaimed works that borrow from Godard films, classic Pop Art, concrète and dub traditions. Môgô is an electronic project from Utrecht, influenced by drone, dub & minimal (dance) music. DJ Daddy Don will be spinning the finest electronic records.